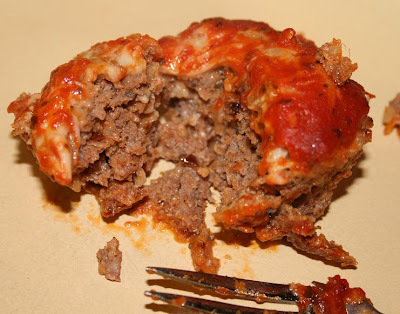 Tonight we are having Muffin Tin Italian Meatloafs for dinner. This is definitely one of my husband's favorite meals and we haven't had this in a while. Heat oven to 350 and spray your muffin cups with Pam. Fill them with your mixture- I usually get about 9 out of a pound of ground beef. This part is optional- but we like cheese, so I add some cheese to the top. Annnnnnnd then I spoon on some more sauce.... love the sauce. And voila! You've got perfectly cooked mini meatloafs! A serving is about 2, or 3 if you are a husband who really loves these! I'm making those this weekend! I looked in the freezer tonight and thought "what the hell am I going to do with this ground meat? Tacos again?"